Deviled Egg Sliders - an easy side dish or appetizer and such a great combo of flavors! slices Use your favorite! Oven baked rolls, Hawaiian rolls or of toasty, crunchy bread (my favorite!). Peel eggs & finely chop. Mix together eggs, mayonnaise, mustard. Add salt & pepper, taste to adjust seasoning. Refrigerate until you're ready to use. Mix together ingredients and taste to adjust seasoning. 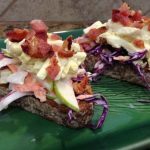 Take your bread - rolls or crusty toast and layer on the ingredients; bread, topped with coleslaw, topped with egg salad, topped with bacon! Yum!!! These are so tasty! What a great use of leftover eggs from the holidays!! !